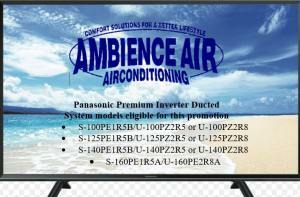 Panasonic Premium Ducted Inverter Sale – Bonus Offers on all Panasonic Ducted Air Conditioners* – Sale on now! homeSpecials and Air Conditioner SalesPanasonic Premium Ducted Inverter Sale – Bonus Offers on all Panasonic Ducted Air Conditioners* – Sale on now! If it is quality and perfection you are after then Panasonic is the Premium Ducted Reverse Cycle Air Conditioning System for you. 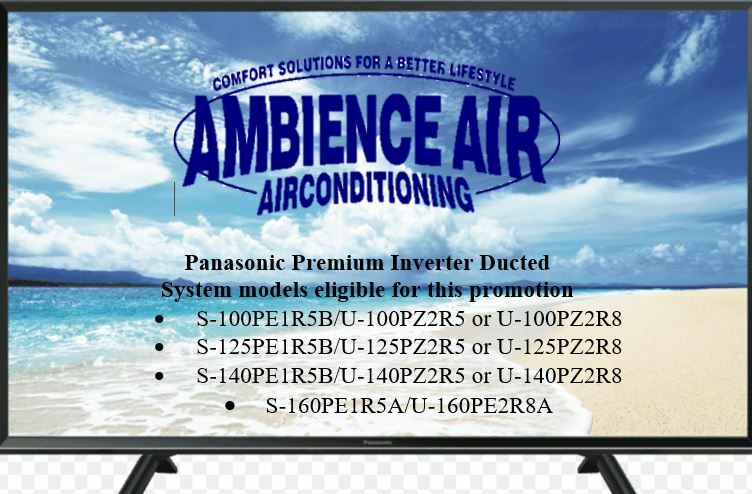 Right Now Ambience Air have packaged up “OUR BEST EVER” Panasonic Premium Inverter ducted reverse cycle comfort solution with added value savings across the entire ducted product range so get a free quote today. Contact our friendly team at your local Ambience Air showroom today! 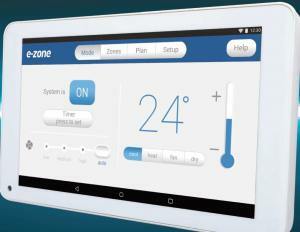 A touchscreen comfort controller that is also a smart tablet device. Includes Wi-Fi app that allows you to control your system from anywhere in the world through your smart device. At the touch of a button you can adjust the airflow from 5% – 100% for perfect comfort in each zoned area. Call us now on 1300 262 436 to find out how to upgrade to the latest Advantage Air “MyAir5” control system that can comfort you with the perfect temperature in each room with temperature sensors and with the ability to add motion sensors saving you even more on energy costs. 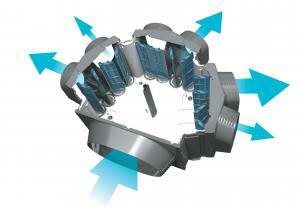 See MyAir5 Brochure download below to find out more. BUT WAIT – THERE’S MORE BONUS INCENTIVES ON OFFER! Platinum Duct offers greater reflection and better insulation properties through high density polyester lining. standards and includes a Full 10 year manufacturers warranty. Take advantage of our Streamline ceiling grills that are included as a product that not only work better, they also look better. These Streamline vent blades look stylish as they sit completely flush to the ceiling. Our Streamline grills are Australian made and manufactured here in WA and don’t turn yellow over time like other ceiling diffusers available. 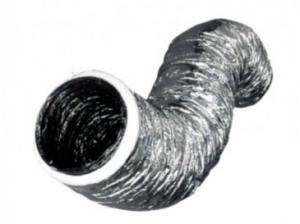 Included in this offer are the Australian Design Mark innovation awarded Exact Air Regulators. Instead of a single scoop old design damper our Exact Air Regulators have four Opposed Blade Dampers (OBDs) that can open and close in precise increments. The OBDs have 21 different locked positions that will reward you with smoother, quieter more even airflow throughout each zoned area for perfect comfort. Our Purtech return air grill comes with an electrostatic triple layer filter and attracts more dust particles to the fibres resulting in 30% cleaner air than standard single layer filters. 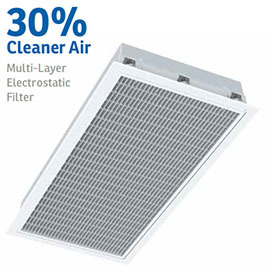 A dirty return air grill and filter can directly impact on a system’s efficiency but ours has been designed for easy cleaning because you deserve to breathe purified air in your home. Our Purtech return covered by a 10 year manufacture warranty. Whether you are building, renovating, replacing your existing air conditioning system, upgrading from evaporative cooling to ducted reverse cycle heating and cooling, or living in your home without a comfort solution, Ambience Air is one of “WA’S LARGEST SELLERS OF PANASONIC” awarded and with our huge buying power will save you on the full range of Premium Panasonic Inverter Ducted systems. Contact our friendly team at your local Ambience Air showroom and learn more about the latest technology upgrades that will not only add value to your investment, but save you on energy usage for many years to come. It takes around 15 minutes to apply and get approved for our NO DEPOSIT & INTEREST FREE FINANCE so take the next step and Click here to APPLY NOW! Call us to save on your new Panasonic comfort system with this month’s special offers whilst stocks last. WHY WAIT? OWN YOURS NOW WITH FLEXIBLE FINANCE OPTIONS. We have deferred payments, interest free and low start up rate finance options to suit your individual needs so don’t delay, get pre-approved finance now and take advantage of an affordable finance solution today. We are passing on the savings for a bulk purchase of Panasonic premium ducted inverter air conditioning systems this month and offering additional bonus incentives to win your business. SALE ON NOW BUT ONLY WHILE STOCKS LAST! Call to book your free in home consultation and take advantage of this opportunity to save thousands today. Call us now 1300 262 436 all areas.